Cuyamaca Rancho State Park was temporarily closed after the Cedar Fire of 2003. The California Department of Parks and Recreation has been working diligently to reopen as much as the park as possible. Through volunteer labor, park staff, and the support of non-profit organizations, much of the park has been opened. The Del Mar Fairgrounds is located off I-5 just north of Del Mar. The Fairgrounds are home to the Del Mar Racetrack as well as stables, numerous exhibit halls and event rings. The site opens up to the Pacific Ocean on it western end and many of buildings have ocean views. During racing season, race horses and their handlers are often seen exercising on the beach. 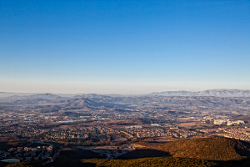 Open every day from dawn til dusk, the trail here rewards hikers with one of the best views of North County. With an elevation of roughly 1,000 feet, if you’re up early enough you can watch the sunrise. On a clear day, you can see all the way to the ocean. Restrooms, picnic areas, an amphitheater and free telescope are available for the public. Notice: The Reserve has reopened. Fort Rosecrans National Cemetery, located on the Point Loma peninsula, became an Army post cemetery in the 1860s.? Some of those who fell in the battle of San Pasqual in 1846 are buried here as are the victims of the USS Bennington explosion in 1905. Veterans of WW I, WW II, Korea, VietNam and now the Gulf wars lie here in neat rows under white headstones marked with crosses or the Star of David. The Gaslamp Quarter is San Diego's entertainment center. It offers tourists and residents 80 restaurants, clubs, theatres and galleries located in 16 blocks of historical Victorian architecture. There are 95 historic markers on buildings that display stunning facades and other architectural details. Belmont Park, located in Mission Beach, is an old-fashioned beachfront amusement park complete with wooden roller coaster, a tilt-a-whirl, bumper cars and many other traditional rides. The park and the Giant Dipper Roller Coaster and Plunge were originally opened in 1925 and were popular attractions for San Diegans throughout the 30s and 40s. However, by the 6os and 70s the park had fallen on hard times and was almost demolished. A regional mall with more than 100 stores, movie theater and several national chain restaurants. Guajome Adobe is an historic hacienda built in the 1850s for one of San Diego's early families. Originally the land belonged to Mission San Luis Rey and then to two Indians. The owners sold the land to Don Abel Stearns who gave it to his sister-in-law, Ysidora Bandini de Couts, as a wedding gift. Ysidora and her husband Cave Couts turned the rancho into the social center of northern San Diego County. The adobe was the site of many fiestas and was visited by the elite from all over the state. Horton Plaza retail/entertainment center ingenuously houses over 140 shops and restaurants in a colorful labyrinth connecting seven open-air split levels. This shopping center is now a local landmark and a tribute to the creativity and history of San Diego.